Karva Chauth is observed on the fourth day after Sharad Purnima. 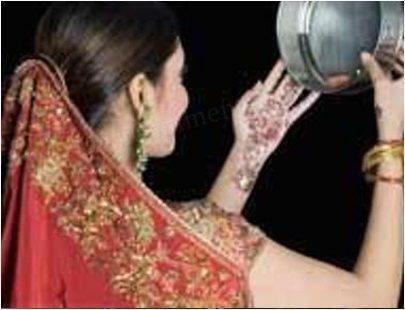 As the name suggests, Karva means an earthen pot or pitcher, and Chauth means the fourth Lunar day. This festival is celebrated by Hindus and Sikhs in North India with great joy and religious fervour. A few days before this fast is observed, married women buy new earthen pitchers and paint it with beautiful colours. On the day of the festival, they observe a strict fast, shunning even water till the moon appears in the sky. Karva Chauth is the most important day for married Hindu women, as they seek long life and well-being of their husbands. On the day of the fast, women worship the rising moon with Shodasopachar (16-fold worship). All shringar (ornaments) items, along with beautiful clothes, are offered to an elder sister-in-law and mother-in-law after touching their feet. After performing the rituals, women take a sip of water and food from their husbands' hands and break their fast. On this day, women must read and listen to the Karva Chauth Vrat Katha and donate money and gifts to the Brahmins. This festival is usually celebrated during the harvest of summer crops. It is believed that women who observe Karva Chauth become Akhanda Saubhagyavati (fortunate for ever). This year, Karva Chauth falls on 7th October, 2009. The day is very auspicious as Sarvarthsiddhi yoga starts at 10.52 and ends next day at sunrise. The moon will be visible at 20:13 all over India. There was once a Brahmin named Ved Sharma, who had seven sons and one daughter, whose name was Veeravati. She was married to a Brahmin named Sudarshan. On the occasion of the first Karva Chauth after her marriage, she went to her parents' house and observed a fast along with her sisters-in-law. But Veeravati could not stand the rigors of fasting and fell ill. The brothers could not see her plight and thought of a novel plan to end her fast. They made a large fire at a distance in the field and hung a cloth behind the fire that resembled a rising moon. They told Veeravati that the moon has risen and urged her to offer puja. After offering the puja, she broke her fast. But soon after she broke her fast, she got the news of her husband's illness and subsequent death. Next, Indrani, wife of Lord Indra, descended on earth to observe fast on the occasion of Karva Chauth. When Veeravati came to know of Indrani?s arrival, she went to her and prayed for her husband's life. Indrani told Veeravati that her husband will live again only if she observes Karva Chauth with its proper rites and rituals. Thus, the legend goes that Veeravati observed the fast and brought her husband back to life. Draupadi is also said to have observed this fast for the longevity and well-being of her five husbands.